Woodwork in Early Years has so much to offer young children and I am keen that all children get opportunities to experience it. It provides a truly unique and profound experience. I deliver keynotes about woodwork and regularly deliver CPD/Inset training around the country and overseas. Below are some of my thoughts and information about woodwork that will hopefully encourage others to embrace woodwork. Woodwork provides a unique learning experience for young children. It is rich in so many areas of learning and development and it is an activity which children really enjoy doing, being absorbed for extended periods of time. It encompasses creative thinking, maths skills, scientific investigation, physical development and coordination, developing language and vocabulary, and much more. It is wonderful for building self- esteem and confidence. This is for a combination of reasons; through being empowered to use real tools, by being given responsibility, accomplishing tasks that they initially feel to be challenging, gaining new skills and finally taking pride in their creations. I’m passionate about the depth that woodwork has to offer. 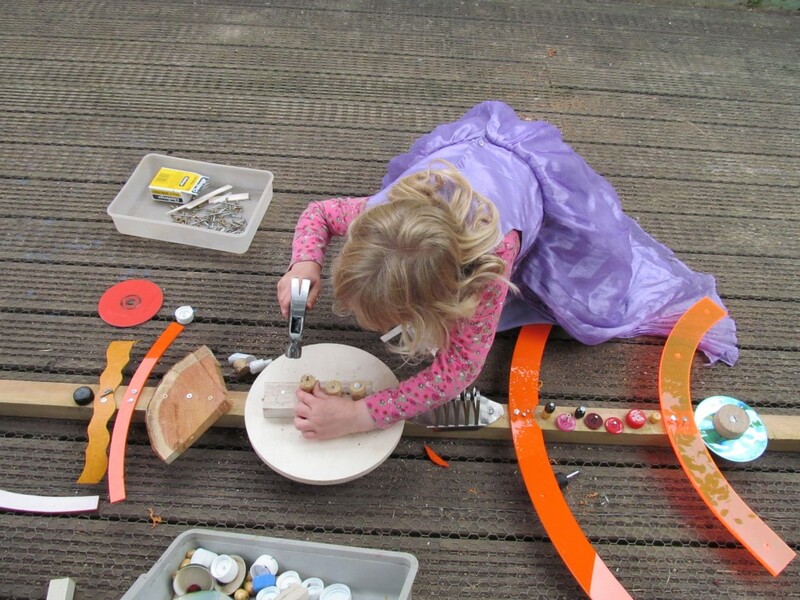 I have worked as an Artist in Residence in early year’s settings for many years, introducing children to many different provocations to encourage creativity. I have found woodwork has consistently provided the children with a profound experience. With the decline of woodwork in primary and secondary schools this could be children’s only experience of working with tools. We are letting children down as many will go on to work in vocational professions working with tools and the ability to make is integral to design and innovation making prototypes etc. Woodwork provides a wonderful medium to explore creative thinking and creativity, increasingly important qualities in our changing world as are the skills to make and repair as opposed to consume and dispose. 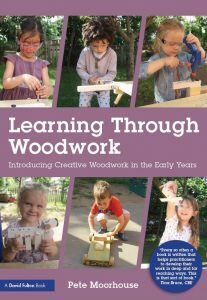 Why Woodwork in Early Years Education? The first thing visiting teachers notice when they observe our children working with wood is their deep levels of engagement and concentration. Secondly they comment on how long the children seem to remain absorbed in their explorations. Many people are surprised that we consider introducing woodwork to young children, largely with concerns over safety but it is in fact a low risk activity and we have been successfully introducing woodwork safely to pre-school children for many years. Woodwork has much to offer children as it is so rich in learning opportunities and has many possibilities for creative exploration. It is essentially a huge win win. It is an activity that they greatly enjoy, being deeply involved and concentrating for sustained periods and it provides a rich multitude of associated learning and development. Children immediately feel valued and empowered. Once involved, the delight, satisfaction and pride in their own work and learning is clearly visible. This sense of empowerment and achievement provides a visible boost to their self-estee and self-confidence. At first the children are “taught” in a traditional sense how to use the tools and try techniques in a safe and appropriate way. As they make their first few tentative taps with the hammer you can tell that they are often a little apprehensive and question if they will be able to do it, but very quickly they are banging in nail after nail with confidence and delight. As soon as they have mastered this basic skill they can move into open ended creative exploration, joining various sections of wood to make all sorts of creations. 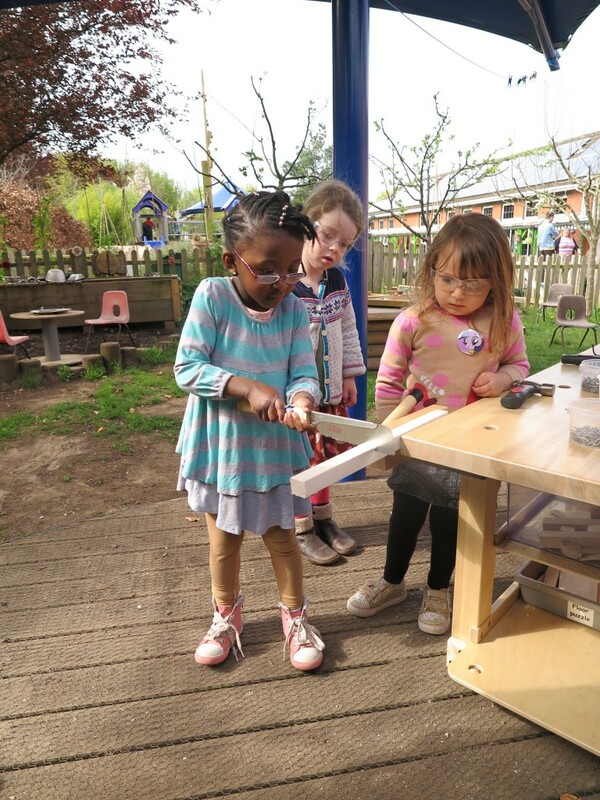 Woodwork allows the introduction of new layers of learning as new tools and skills are introduced once the children feel confident – starting with hammers, screwdrivers, and a saw, then moving on to introduce drills, clamps, wrenches, pliers, spanners and so on. Children develop through their own learning at their own pace and find their own challenges. As the children explore the tools and their possibilities their imagination, creative thinking and problem solving really begin to emerge.